It’s funny how some stuffies become instant ground cover for me, while others last a long, long time. Chicken was a gift from my friends Forrest and Autumn and their mom Leslie. 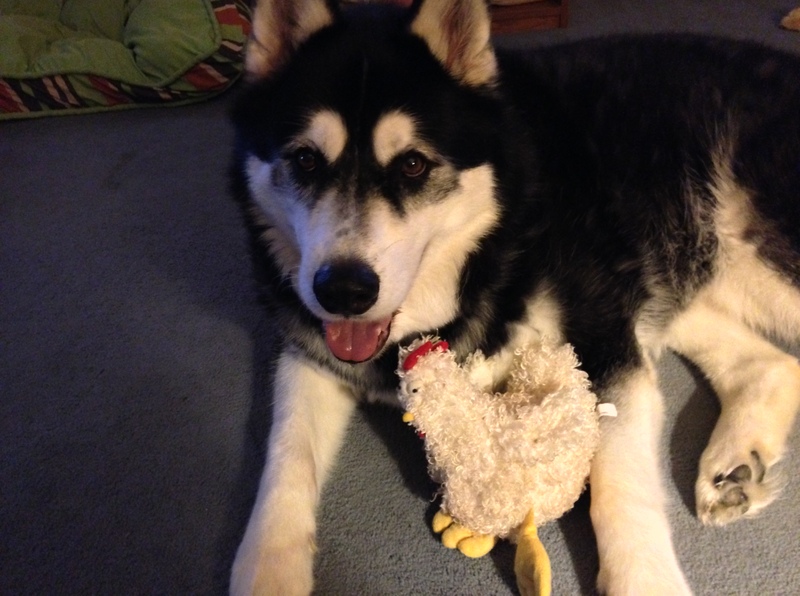 His squeaker is gone, and he’s past due for a bath, but I love to play with my chicken. Compare that to the other stuffed chicken sent at the same time. That chicken is no longer with us. Rest in peace, other chicken. « Wordless Wednesday- Come to the Beach! You’re right Rumpy – some stuffies are keepers and others are lunch (hahaha). I like enjoying all aspects of my toys- inside and out! Some stuffies are simply more valuable! I hope the other chicken was tasty? Rest in pieces, Other Chicken! Oh Rumpy …sounds about right to me..although my Forrest has no stuffies left…all other toys are out of reach! lesson learned after my sisters Shepherd had half a tennis ball surgically removed ..nasty op…so it’s out of the way after play for our boys..in fact they hang in a string shopping bag a whole collection i call the yukky dip…dirty slime covered ..just what dogs love 🙂 love the chicken Rumpy he suits you! Wow, a tennis ball? And to think all I eat is garbage and cat toys! The Boxers don’t have any soft toys, they just don’t last the tug o’ war 🙂 Take care of chicken. That’s sweet. It reminds me of my dog Goody. He is a German shepherd. He takes such great care of his ‘babies’. He even licks them clean. my doggie kristina has a lot of stuffies and i always put them in a box only to find them scattered in the house again.. I take turns having favorites. Chicken, then monkey the plastic squeaker, then my dinosaur! Love the chicken that lasted, Rumpy. OTHER Chicken…. Prolly had it Coming… Just sayin. THERE IS a major difference between One Stuffie and Others. We actually have one that is (I KID YOU NOT) OVER 18 YEARS OLD. It survived the 3 short hairs that came BEFORE US and then survived OUR PUPPY HOOD and it STILL SQUEEKS. TRUE STORY!!!! I am impressed that he is still recognizable. Eko leaves NO evidence when he gets his paws on a squeaker. I can tell you are a stuffie connoisseur, Rumpy! we know why that chicken did not cross the road…:) Rumpy you are in fine form!! Oh! That’s a really good one. We love it! Chicken looks strong and healthy. Let’s hope nothing unexpected happens…. I have to protect him from June Buggie! There is a reason….. it’s just not known to anyone but us! For sure! And DeDe won’t even play with a stuffie, so they’re all mine! Chicken love! Molly enjoys pulling all the stuffing out of a red bone…then I stuff it back in and stitch it up…and she finds a tiny hole and pulls it out…and I stuff it back up…repeat….she doesn’t eat the stuffing and waits patiently…but wish she’s just use a kleenex box or something…. A dog’s gotta do what a dog’s gotta do! Nice of you to treat your chicken with such TLC. Rumpy, what great timing that Forrest and Autumn gave you a chicken just when your other one went away. Take good care of your chicken. Some toys just seem to fall abpart don’t they! Same thing happens in our house! I can never pick which fuzzies are going to live long lives and which ones aren’t? Are you guys originally from Canada?! I’ve only heard Canadians refer to stuffed animals as “stuffies”! No, but we have Canadian friends online that we picked up the word from. So nice to see a stuffie survive, they never last long in our house and when unstuffed they either end up in tiny pieces or buried in the garden. I don’t understand Chester and Gretel’s rating criteria either. Chester pretty much tears anything stuffed or with a squeaker up but the Organic Cotton Simply Fido toys last a long time. Maybe because it is stuffed with cotton and feels different? Dunno.